Starting in 2001, we wanted to really test our Catalytic PURE AIR purifier. So we went to the toughest indoor air environments we could think of – the casino and hotel industry. Catalytic PURE AIR offered the industry of point of air purifiers with the technology and capacity to tackle the toughest indoor air quality problems. Now with hundreds of installations in casinos, hotels and public spaces, Catalytic PURE AIR purifiers are helping improve indoor air quality 24/7 everyday. Catalytic PURE AIR works with major hotels and smaller properties such as the Peppermill Resort Spa Casino, Gold Dust West properties, and the Atlantis Casino Resort Spa to improve indoor air quality and reduce smoke and odor complaints. 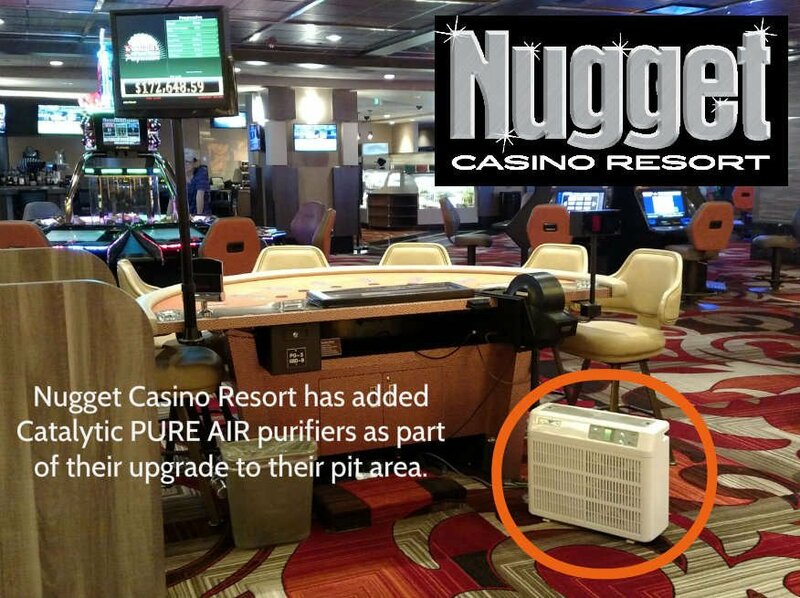 Nugget Casino Resort has added Catalytic PURE AIR purifiers to their Housekeeping Department. Catalytic PURE AIR purifiers were already being utilized in the new Bingo Area on the main gaming floor (pictured), but the Housekeeping Department has added 5 additional air purifiers to improve indoor air quality in the smoking hotel rooms, public spaces and for odor control. 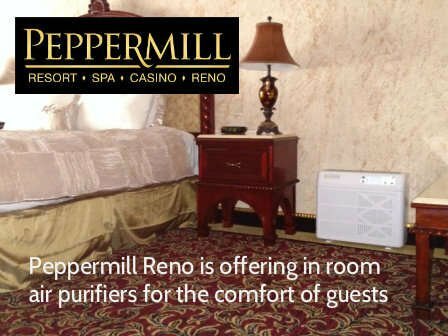 Application: The Peppermill Resort Spa Casino in Reno, NV is using Catalytic PURE AIR purifiers in their smoking rooms, casinos floor, front desk areas (pictured left) and sports book to reduce smoke and improve indoor air quality. Application: Gold Dust West Reno uses Catalytic PURE AIR purifiers on their gaming floor (pictured above) to improve indoor air quality. Placed at the end of slot banks and in the bar area, the air purifiers keep customers happy and gaming. Gold Dust West Reno has 40 air purifiers on their property. Testimonial: “They’re doing fantastic,” .... “We just ordered more, they are doing so good.” Albert Johnson, General Manager, Gold Dust West Reno. Application: Terry Boyle, General Manager of the Winnemucca Inn and Casino called us and said they were getting complaints about smoke in the restaurant that is connected to the casino. We set up a trial with Terry to place Catalytic PURE AIR purifiers in the aisle from the front desk to the restaurant through the casino area. (pictured above). Testimonial: "It’s been less than two weeks and the verdict is already in these make a difference!" Terry Boyle, General Manager, Winnemucca Inn and Casino. Application: Atlantis Casino Resort Salon uses Catalytic PURE AIR purifiers in their Salon area to improve indoor air quality. The high end salon wanted improved indoor air quality in the salon being used for manicures, pedicures and hair styling. Customers and staff appreciate the improved indoor air quality.